Images are ripped straight from the PDF document without recompression. This means that extracted images will have the maximum possible quality, only limited by the document's original quality settings! 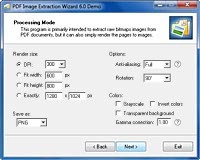 PDF Wiz can also render complete pages as separate images at desired resolution. You can choose to rotate the pages, make the paper background transparent, apply gamma correction and many other useful options. Saves images from inside pdf documents. No re-compression for best possible quality. Easy to use wizard style program. Batch mode: extract from multiple PDF's in one go. Does not require Adobe Acrobat. Can be limited to specific pages. Extract everything, or only large or small images. 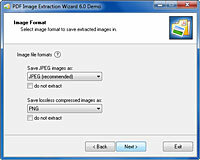 Saves images as Jpeg, Tiff, Png, Bmp and Tga. Extracts from password protected docs. Rotates, flips & merges grabbed images if needed. Can skip photos or line drawings if wanted. 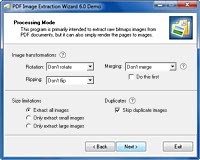 Can merge images that were sliced by the PDF saver. Add page number to extracted filenames. Render pages to picture sequance, complete with text, bitmaps and vector images. New! Render options includes page rotation, paper background transparency, grayscale rendering, invert colors, gamma correction, anti-aliasing strength, setting size in DPI or specific width and height. New!